Dear Alida & Angela, I‘ll be sending a formal thank you note once we have our pictures but I just wanted to drop a line to let you both know how happy I was with the work that you did for us. Alida and the girls filled multiple roles on Saturday that really just put my mind at ease. By the time the wedding came along, I knew I was in capable hands. I feel that there aren‘t any adequate enough words to describe how wonderful and helpful you all were for me. If Alida wasn‘t there with the binder and the assistants, I‘m sure I would‘ve been a complete nut case on my wedding day. My main regret is that I didn‘t think of hiring you earlier in the planning process! If I have to plan a large scale event ever again, I know who I‘ll be calling. I‘ll post a WeddingWire review soon!Thank you for everything. We did not want to waste any time letting you know how grateful we are for all your efforts to make our wedding celebration a success! Please know that you made our dream wedding come true. There aren‘t enough words to be able to express how thankful we are for your help when planning our wedding. From the moment we met you were always very professional, punctual, understanding, patient and so creative. You always listened to everything we said and always kept our wishes as a priority. The email reminders definitely help keep me organized and on top of things. Juliet Events introduced us to excellent vendors who were kept within our budget and our visions. We really had nothing to worry about at all during our planning since we knew we can count on you to help us through it all. It was a wonderful experience. Thank you, thank you, thank you for a wonderful wedding. Everything was set up so beautifully and went so smoothly, and it couldn‘t have happened without you. From picking the vendors to writing the place cards, thank you for helping us every step of the way. We have a feeling we‘ll never know exactly how much work goes into planning a wedding...but we‘re okay with that. The two of you are truly amazing at what you do; thank you for being so organized and so fast with responding to all our questions this past year. We are happy to serve as references if you ever have need of us in the future. When I got engaged my sister immediately put me in contact with Juliet Events. Angela and Alida were a lifesaver for planning my November wedding in less than 6 months. They gave me information that I would have never found on my own. From finding a makeup artist to budget friendly invitations they knew exactly how to find what would be a perfect match for me. They handled the most frustrating situations with ease and helped me to make decisions on every small detail keeping me on task and reminding me to stay on task since I tend to procrastinate. On the day of the wedding they helped make sure everything went perfectly. Ensuring I stayed cool, calm collected and put smiles on my parents faces. Alida‘s presence while I got ready kept the room light heated and I can‘t thank Angela enough for finding me eyedrops so I could wear my contacts that day. Without Angela and Alida, the buttons on my dress would have surely been a debacle. They took my ideas and brought them to life almost like reading my mind. Thank you so much for all of your help. You helped me maintain control of wedding and helping us have such a great day. Thank you so much for all your help before and during the wedding. You were always so prompt and caring when I needed advice or an outside opinion. I couln‘t have done it without you both. Thank you so much for the outstanding services and help you provided to make our wedding so beautiful and flawless. We were so grateful to have such professional planners help us perfectly plan the wedding of our dreams. your expertise and knowledge really brought out the theme and style we envisioned. The set up was just breathtaking and hard work was really appreciated. we would highly recommend you to anyone looking for a perfectly planned event. We are still walking on air. I want to thank you from the bottom of my heart for everything you did to help us make things perfect. You helped turn all our ideas into a wedding day, guided us when we were clueless, and worked so hard (and patiently!) to make up for the fact that we STILL left a trillion things until the eleventh hour. You and your team are magicians, I am convinced. So thank you, thank you, thank you! You all did a phenominal job and worked through our many changes, even at the last minute. We were extremely happy with your professionalism, dedication and commitment. You remain our event planner of choice. From the bottom of our hearts we thank you for all your hard work and excellence. You were truly a blessing. About two months before the wedding, I realized I needed help and if I didn‘t get it I was NOT going to enjoy the big day! Thankfully Juliet Events was available on our date and we chose their Week of Wedding Package. I only wish I had contacted them sooner. Alida and Angela were really wonderful. They went through the details with us and filled in some of the holes we had, reviewed our contracts and ran our rehearsal. (Thank goodness since the officiant couldn‘t make it and none of us had any idea what we were doing!) They also did a fabulous job managing the day of. We really got to relax and enjoy the day and we really enjoyed having them there. Thank you Alida and Angela! Alida and Angela, I‘ll be a reference for you anytime! You literally gave me my dream wedding. It was absolutely beautiful, nothing went wrong. I wasn‘t stressed about anything, Juliet Events took care of everything. You have wonderful ideas, I could never have pulled off such a gorgeous wedding without your hard work. I really miss not talking to you almost everyday as we did before the wedding. You became more than my wedding planners, you truly became my close friends. I can‘t thank you enough for all that you did for me. You really made our day perfect and absolutely stress free. I can‘t wait to recommend you to all the brides in my life. I am so, so thankful that I chose you! I was very, very happy with the way everything was decorated. I don‘t know what I would have done without my constant contact with you leading up to the wedding. It really helped ease my stress. I can‘t wait to share the photographs with you. Thank you for everything. We had the best weekend of our lives. Everyone had nothing but great things to say. We highly recommend you to everyone. I enjoyed working with you and I hope to host many more events together. I have to tell you that you did a great job putting everything together. The room, linens, flowers, cake, candy table...everything looked amazing. 2010 Brides Choice Award! We are happy to announce that Juliet Events is among the very best Wedding Planners within the WeddingWire Network, which includes WeddingWire and Martha Stewart Weddings. 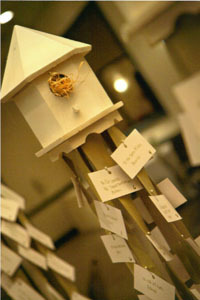 We would like to thank our past newlyweds for nominating us for the 2010 Bride’s Choice Awards. I just wanted to thank you both for everything. For making my special day peaceful and calm. It was great having you as wedding planners. It was ten times better than what I dreamed of. Thank you again for everything you both did to make Kendyl and Andrew‘s wedding so special. Not surprisingly, it all went off without a hitch. I will continue to refer you both to anyone I know who is planning a wedding. Thank you very much for making our wedding day PERFECT! We were so happy you were there on our special day. Everything went beautifully and we owe it to you!! We appreciate all of the extra attention to detail. It was a pleasure to work with you. You are the BEST- the best, the best! I will never be able to thank you enough for the tremendous job you did. I was such a wreck before I met you. You made everything so easy and lovely. Thank you for everything. We had the most beautiful wedding! I can‘t believe how smooth everything goes when you two are around. Thanks again. I don‘t even know where to begin. "Thank you" really doesn‘t seem appropriate for everthing you‘ve done for me. Everything came out perfect! I was actually able to enjoy our weding day. You were a blessing. I don‘t know what I would have done without you! Thank you so much for the wonderful job you did on the wedding! Everything came together so beautifully! Words can not express our appreciation for all your hard work and dedication to our wedding. It was such a pleasure working with you. You made my vision come true! My husband & I thank Juliet Events from the bottom of our hearts for making our day a beautiful & memorable one. Alida and Angela came up with great ideas to make our reception beautiful and at the same time stayed within the budget we gave them. If you want the wedding of your dreams to turn into reality, I highly reccomend Juliet Events. They will make it happen. Your work speaks for itself. The event was beautiful and glamorous. You were a tremendous asset in planning and executing my wedding. Your guidance on what we would need, how to arrange the flow and making sure the guests were well attended to was indispensable. I would absolutely recommend you without any reservations. I wanted to personally say "Thank You So Much" for all your help on the day of the wedding. (7/3/08) Not only did you and your team go above and beyond but you guys did a beautiful job. My only regret is not hiring you sooner to help me throughout the planning of our wedding. Thank you again for everything...YOU GUYS ARE THE BEST!! Alida and Angela of Juliet Events were indespensable in the planning of my August 2007 wedding. I was so happy to find a wedding planner in New Jersey to help me plan my wedding long distance. They were instrumental in selecting several of our vendors. They advised us as to what we needed from each vendor and acted as liaisons with our vendors as our wedding day approached. They were always available to us. They made the day effortless for me, but I know they worked tirelessly to achieve that. It was an amazing day. I recommend them very highly. I planned a NYC wedding from Los angeles and could not have done it without the support of Angela & Alida. They are more than just wedding planners, they become family. They looked after every detail as if it were their own wedding. They made me feel like their only bride - constantly responsive to all my questions and concerns.